Now that we’ve seen the return of full length previews for independent artists, we wanted to go a step further and build some new discovery tools to help introduce users to emerging artists offering direct-from-artist tracks, and vice versa. After some late nights in the Last.fm MIR laboratory, we’ve come up with a dedicated direct-from-artist recommendations page on our playground, where you can play a personalised selection of full length tracks. Please try it out and let us know what you discover! We’re going to keep working on this functionality and building it into the rest of Last.fm, so your feedback can help us improve. As an artist who is on LastFM, I appreciate this new possibility. I just got an email from scott@tweekly.fm theyre telling about changes on lastfm and also asking for donations….Is this site a lastfm partner??? Silvia — Tweekly.fm makes use of public Last.fm web services, but it is an entirely separate project. Jacque — can you post some examples? Thank you! Loving it – would be awesome to play as a station though, a bit annoying to have to come back and hit play on each track. This is a great service for music loves looking for new, “undiscovered” bands. Will definitely be checking this out. Once again, thank you, last.fm. You guys are great. good artcile,i like it,thank you for your share! 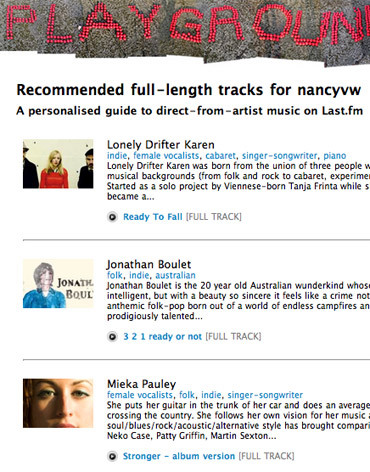 This is a wonderful feature – I’ve already found several good artists I didn’t know this way. Thank you!!! It doesn’t matter, if you can’t listen to it using the iphone app. I can’t seem to get any music I want to listen to using the app. It frustrates me,I’m having to listen pandora which honestly is horrible. !!!!!! I can’t even listen to local natives that works on your web client but not on the iphone. Thanks! That’s a good step in the right direction. I used to do more exchanges and recommendations with other people, but now we often can’t listen to the whole track without first adding it to a playlist or finding some other work-around. People using different browsers get different full plays. That is confusing, but thanks for working to improve that scenario. Sure miss the good ‘ol days before someone decided to mess things up- but keep on adding things— maybe some day we’ll get close to what we had before. I don’t expect to get to listen to every tune imaginable on demand as often as I would like- for $3 a month. It still beats commercial radio- by a long shot.